In order to provide his patients with the very best dental implant treatment, Dr Peter Poulos uses image guided surgery. This helps to ensure each implant is inserted into precisely the correct position, making treatment smoother and more successful. 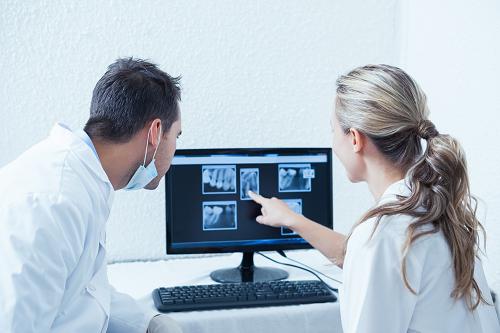 When you visit Dr Poulos for implant treatment you will need to have a cone beam CT scan which produces computerised 3-D images of your jawbone. These images are essential when planning implant treatment, allowing Dr Poulos to choose the perfect position for each dental implant, avoiding essential structures in your jawbone while ensuring the implant will be fully functional and aesthetically pleasing. Once your implant surgery has been planned, Dr Poulos will use this computerised information to make a surgical guide, a template that will be used during your surgery. This highly detailed planning process will help Dr Poulos provide the very highest standard of dental implant treatment.